In Blessed are the Dead, San Francisco Bay Area newspaper reporter Gabriella Giovanni spends her days on the crime beat flitting in and out of other people’s nightmares, yet walking away unscathed. When a little girl disappears on the way to the school bus stop, her quest for justice and a front-page story leads her to a convicted kidnapper, Jack Dean Johnson, who reels her in with promises to reveal his exploits as a serial killer to her alone. Gabriella's passion for her job quickly spirals into obsession when she begins to suspect the kidnapper may have ties to her own dark past: her sister’s kidnapping and murder. Risking her life, her job, and everything she holds dear, Gabriella embarks on a path to find answers and stop a deranged murdered before he strikes again. My favourite authors are the ones whose books I will buy unseen. In other words, if I hear a new book is coming out from Lisa Unger, Sara Gran, S.E. Hinton, Adriana Trigiani, or Edna Buchanan, I’ll buy it without knowing anything else about it. With that said, there are dozens of other writers I love and read. People can find me on my website, www.kristibelcamino.com on Facebook, https://www.facebook.com/kristibelcaminowriter, and on Twitter, @KristiBelcamino. For a more personal interaction and early information about my books, they can go to my website and sign up for my newsletter. For the first few months, to celebrate having my first book published, I’m giving away all sorts of cool items, such as a brand new Kindle, bags of Ghirardelli chocolate, a Strand Bookstore tote bag full of all the authors who gave me a blurb, and more. I started Blessed are the Dead on the September day my youngest started kindergarten and printed out my first draft by my birthday in late October. I spent another year revising the novel. Now, it takes me three months to write the first draft of a novel and about another three to revise it. I buy into Stephen King’s suggestion that writing the first draft of a novel takes a season. In my case, I wrote my latest novel in spring! For now, my book is available at all the usual suspects online: Amazon, Barnes and Noble, and so on. 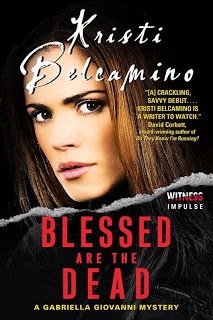 I’m chomping at the bit to begin writing Blessed are those who Mourn, my third book in the Gabriella Giovanni Mystery Series. The first book, Blessed are the Dead, comes out June 10th. The second book, Blessed are the Meek, comes out July 8th. I have a strong idea what the book will be about, but am excited to see where the characters take me this time. I’m extremely luck and grateful that my husband supports my writing career. When our children were old enough to attend school full time, he fully supported and encouraged me staying home and writing instead of going back into journalism full time. I was reading through some promotion materials for my book and saw that my publisher had told people if they like Laura Lippman’s Tess Monaghan series, they would like my book, Blessed are the Dead. Of course, I was incredibly flattered by that awesome comparison, so I decided to go back and re-read the first book in Lippman’s series, Baltimore Blues. The Outsiders by S.E. Hinton changed and influenced my life in more ways than I can count. Along with really opening my eyes to injustice in this world, it also showed me that a teenage girl could write a book. When I’m not writing, I’m busy being an Italian-American mama, taking care of my two fierce little girls and spending time with my husband. We live around my husband’s big family and love to spend time with them eating and laughing. Thanks so much for introducing us to this author. 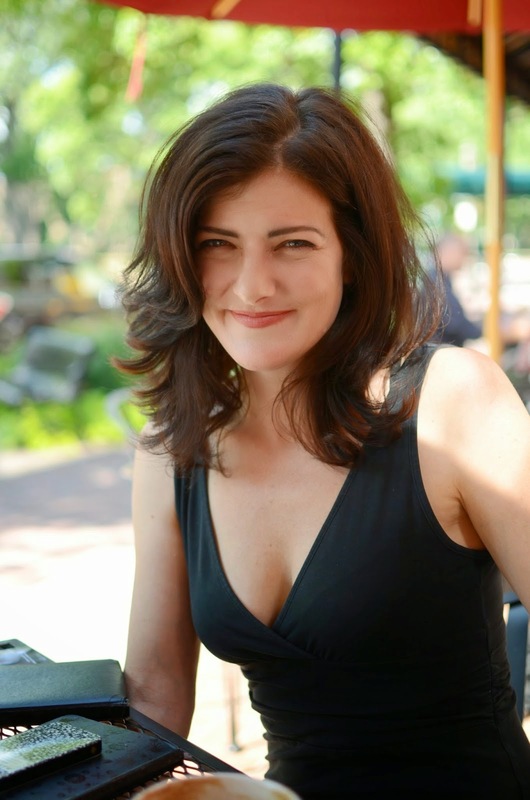 What a terrific interview, with great questions giving us a chance to learn more about Kristi and her work.